نفت و گاز طبیعی مهم‌ترین منابع تأمین انرژی هستند و در معادلات اقتصادی سیاسی جهان اهمیت استراتژیکی دارند و در روابط بین‌المللی نقش مهمی ایفا می‌کنند. از این رو، انتقال و جابجایی این مواد پرارزش از مسائل مهمی است که امروزه بسیار مورد توجه قرار می‌گیرد. این پژوهش به دنبال برآورد کارایی فنی صنعت لوله‌های گاز و نفت ایران می‌باشد. برای این منظور روش تابع مرزی تصادفی ((SFA به کار گرفته شده است. 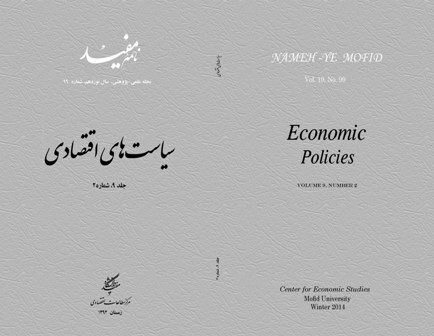 مدل مورد استفاده در این پژوهش، مدل ناکارایی متغیر با زمان بتیس و کولی (1992) می‌باشد. نتایج آزمون‌ها حاکی است که برای تابع تولید صنعت لوله‌سازی، فرم کاب داگلاس بهتر می‌تواند تابع تولید را توضیح دهد. همچنین آماره نسبت راستنمایی تعمیم‌یافته به منظور بررسی وجود آثار ناکارایی فنی محاسبه گردید و نتیجه به دست آمده دلالت بر وجود آثار ناکارایی فنی در این صنعت دارد. با توجه به نتایج به دست آمده میانگین کارآیی فنی صنعت لوله‌های گاز و نفت از 57/53 درصد در سال 1375 با یک روند صعودی به 72/74 درصد در سال 1389 افزایش یافته است. از دلایل صعودی بودن کارایی فنی این صنعت می‌توان به افزایش قیمت نفت و به تبع آن افزایش میزان سرمایه‌گذاری‌های انجام پذیرفته در صنعت گاز و نفت (به خصوص پروژه‌های پارس جنوبی) و نیاز به لوله‌های انتقال اشاره کرد. Oil and natural gas are the most important energy resources and are of strategic importance in global, economic and political relations. Therefore, their transfer equipments and processes are very crucial and using pipe lines for this purpose is considered significant because it is the fastest and safest means. In this study, we attempted to estimate the technical efficiency of oil/gas pipes industry by using the stochastic frontier approach (SFA) method. We also used the Battese and Coelli time varying technical efficiency model. The tests result showed that the Cobb-Douglas production function can explain the pipe manufacturing industry better. Also, we calculated the extended significance ratio statistic to study the existence of any technical inefficiency in this industry; the results proved this. Nation the results also revealed that the average technical efficiency of this industry has increased from 53.57% in 1375 to 74.72% in 1389. One of the reasons for the increasing trend of technical efficiency of this industry is the increase of oil price, and hence, the increased investment in the country’s oil/gas industry (especially, in the South Pars field) and the increased need for pipes. امامی میبدی، علی؛ اصول اندازه‌گیری کارایی و بهره‌وری (علمی کاربردی)، مؤسسه مطالعات و پژوهش‌های بازرگانی، تهران، 1379. امینی، علیرضا؛ نشاط، حاجی محمد؛ «برآورد سری زمانی موجودی سرمایه در اقتصاد ایران طی دوره زمانی 1381-1338»، مجله برنامه و بودجه،1384، شماره 90. حاجیانی، پرویز و همکاران؛ «بررسی کارآیی فنی ناوگان صید میگوی خلیج فارس: مطالعه موردی استان بوشهر»، فصلنامه اقتصاد کشاورزی و توسعه ،1383، شماره 52. خدادکاشی، فرهاد؛ توسلی، مهدی؛ «تخمین کارایی فنی بانک کشاورزی با استفاده از تابع مرزی تصادفی»، فصلنامه پژوهش‌ها و سیاست‌های اقتصادی، 1391، شماره 61. رحیمی سوره، صادق؛ صادقی، حسین؛ «محاسبه و تحلیل عوامل مؤثر در کارآیی تولید طرح‌های مرتع‌داری واگذار شده (خصوصی‌سازی مراتع): مطالعه موردی استان‌های خراسان، یزد و آذربایجان غربی»، فصلنامه اقتصاد کشاورزی و توسعه، ویژه‌نامه سال سیزدهم، مؤسسه پژوهش‌های برنامه‌ریزی و اقتصاد کشاورزی، 1384. زارع، شجاعت؛ «اقتصاد تولید و کارآیی انگور کاران استان خراسان: مطالعه موردی شهرستان کاشمر»، فصلنامه اقتصاد کشاورزی و توسعه، ویژه‌نامه سال سیزدهم، مؤسسه پژوهش‌های برنامه‌ریزی و اقتصاد کشاورزی، 1384. سیدان، محسن؛ «بررسی عوامل مؤثر بر عدم کارآیی فنی بهره‌برداران سیرکار: مطالعه موردی در استان همدان»، مجله پژوهش و سازندگی، 1383، شماره 64. Afriat, S; 1972, "Efficiency estimation of production functions", International Economic Review, Vol. 13.3, PP. 568-598. Aigner, D.C., A.K. Lovell and P. Schmidt; 1977, "formulation and estimation of stochastic frontier production function models", Journal of econometrics, Vol. 6, PP. 21-37. Banker,R.D. Charnes,A. and Cooper,W; 1984, "Some models for estimating technical and scale inefficiencies in data envelopment analysis", Management Science, Vol. 30, PP. 1078-1092. Battese , G.E, A. Heshmati, and L.Hjalmarsson; 1998, "Efficiency of labor use in the Swedish banking industry : A stochastic frontier approach", CEPA working paper 98/06, Department of economics, university of new England , Armidate. Boles,J.N; 1966, "Efficiency squared- efficient computation of efficiency indexes", Proceedings of the Thirty Ninth Annual Meeting of the Western Farm Economics Association, PP.137-142. Charnes, A. Cooper, W.W. and Rhoodes, E; 1978, "Measuring the efficiency of decision making units", European Journal of operational Research, Vol. 2, PP. 429-441. Coelli, T.J. & Perelman, S; 1996, "A comparison of parametric and non parametric distance functions: With Application to European Railways", Crepp Discussion paper no. 96/11, University of Liege, liege. Coelli, T. J; 1996, "A Guide to Frontier Version 4.1:A computer program for frontier production function estimation", CEPA Working Paper 96/07, Department of Econometrics, University of New England Armidale. Debreu, G; 1951, "The Coeficient of Resource Utilization", Econometric, vol. 19:3, PP. 273-290. Farrell, M. J; 1957, "The measurment of productive efficiency", Journal of the Royal Statistical Society.Series A, CXX, Part 3. PP.253-290. Ferrier, C.D, lovell, C.A.h; 1990, "Me assuring cost efficiency in banking", Journal of econometrics, Vol. 496 (1-2), pp. 229-245. Fires, S. & Taki, A; 2004, "cost Efficiency of banks in transition: evidence from 289 banks in 15 post-communist countries", Journal of econometric, pp.1-19. Green, W; 1997, "Frontier production functions" In handbook of applied econometrics, (Volum II: Microeconomics), Hashem Pesaran, M. and Schmidt, P., Blackwell pub. Ltd.,USA, PP.81-166. Koode, D.A. and F.C.Palm; 1986, "Wald criteria for jointly testing equality and inquality restrictions", Econometric, Vol .54 (5), PP. 1243-1248. Koopmans,T.C; 1951, "An Analysis of production as an Efficient Combination of Activities", In T.C. Koopmans (Ed.) Activity Analysis of production and Allocation Cowles Commission for Research in Economics Momograph, Wiley, New York.of the Royal Statistical Society, Series A, CXX, No. 13, Part 3, PP. 253-290. Lopes, R.J. & et al; 2008, "Efficiency analysis of the portuguese beam trawl fleet that targets the common prawn palaemon serratus (pennant)", CEFAGE-UE working paper. Pitt, M.M. and Lee, L.F; 1981, "Measurement and sources of technical inefficiency in the indonesion weaving Industry", Journal of Development Economics, 1981, Vol. 9, PP. 43-64. Sohail, N. & et al; 2012, "Estimation of technical efficiency and investigation of efficiency variables in wheat production: A case of district Sargodha (Pakistan)", Interdisciplinary Journal of Contemporary Research in business, vol. 3, PP.897-904. Tongzon, J. & Heng, WU; 2005, "port privatization,efficiency and competitiveness: some Emprical evidence from container parts (terminals)", transportation research, part A, 39. Tung, pbv; 2010, "Technical efficiency of improved extensive shrimp farming in ca mau province Vietnam", Masters Thesis in Fisheries and Aquaculture Management and Economics, University of Troms.